The McAllen Police Association hosted area law enforcement at a local movie theater and an old school this week for an active shooter training based on real-life events that have rocked communities nationwide. 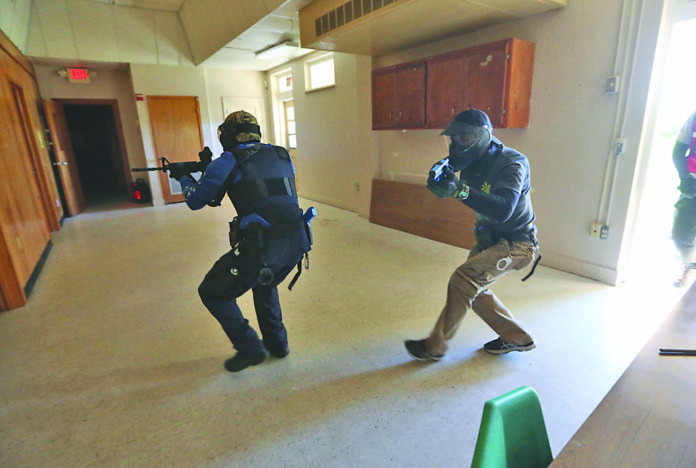 Fifteen area law enforcement officers, who signed up for the basic response survival training, responded to a variety of calls created by the Texas Municipal Police Association to better prepare agencies in the event such a shooting occurred in the Rio Grande Valley. The training required officers to envision “actual shootings at schools, theaters and other scenarios where human lives are being taken,” Alvarado said, but did not publicly disclose the scenarios used in the training, saying doing so would interfere with its effectiveness. He called the classes “a different caliber” than active shooter training offered by police departments in the Rio Grande Valley. 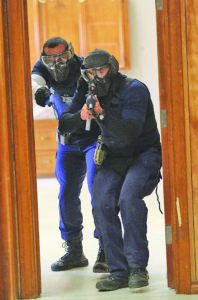 Officers from the McAllen, San Juan and Pharr Police Departments, as well as sheriff’s deputies, participated in the training held Tuesday and Wednesday. The class was limited to 15 participants. From 2000 to 2017, the FBI tallied 250 active shooter incidents nationwide, which have resulted in 2,217 people killed or injured. In 2017, deaths and injuries as a result of active shooters, defined by the agency as a person intending to commit mass murder in a populated area, reached an all time high. The Texas Municipal Police Association along with the McAllen Police Association plans to offer the free course to area law enforcement again in about three months.